Proper markings on the packaging. Proper description on the shipping papers. All 3 require training in hazardous materials. However, what if the proper packaging isn’t available? After all, it is also our responsibility to prevent loss and damage during normal transportation and handling according to FedEx. In the last several years here at ICC, the need for paint can shippers that don’t leak and dent has gone through the roof. I have been contacted by several different large paint distributors all looking to solve the same riddle; how do I get my paint cans from point A to point B without damage and leaking? Challenge accepted! The first step is to decide what metric to use to determine if the packaging will damage or leak during normal transit. Well a while back I wrote a blog on ISTA 6-FEDEX-A testing, http://blog.thecompliancecenter.com/ista-series-6-6-fedex-a-testing-vs-standard-un-testing/, which helps determine how well a package will perform out in the field. So I figured that would be a good starting point. 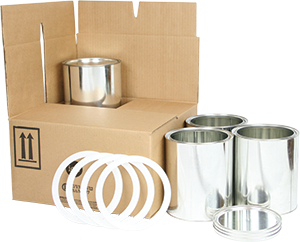 Basically, our goal was to create paint can shippers that not only would survive the 10 drops from 30 inches up that the FedEx testing requires, but also have minimal to no damage on the paint cans at all. Your source for un certified packaging solutions for shipping hazardous materials and dangerous goods of all kinds. Vermiculite-free, clean, safe, and secure 4GV UN certified hazardous chemical shippers for shipping by air, ground, and sea. Use your own inner containers or choose from our wide selection. ICC Compliance Center is a provider of solutions for regulatory compliance in transportation and workplace safety, specializing in labeling, packaging, training and consulting. I consent to receive ICC’s email newsletter, sent once weekly and on special occasions to announce special sales or breaking compliance news. The newsletter contains information, products, and articles to help you keep your company in compliance.